Description: A tiny seafood restaurant/store on the way into Rock Hall from Chestertown. 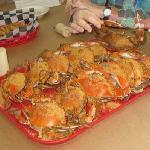 I will drive out of my way to get crab meat from J & J's over the supermarket or other surrounding businesses. They give a great quality and quantity of meat and hardly ever find a shell in the mix. Delicious! Careful. This is no longer J&J as we know it. J&J that received great reviews including one from me closed 5/31. The sign still says J&J but it is under different management. For everyone looking for great food and the great waitress Sharron--it is not here. Just a warning. Sorry everyone. J&J is a small, sensibly priced restaurant that offers superb offerings. This is not a white table cloth restaurant that offers a "dining experience". It is a great place for good food. We go there every Tuesday they have the best crab soup in Kent County, also the owners and the waitress whose name is Sharon is very pleasant. You have a different special to pick from every day if you do not want the menu, would really recommend this place, check it out.